DHAHRAN, January 28, 2004 -- As the Ministry of Petroleum and Mineral Resources concluded the last day of bidding in the Kingdom of Saudi Arabia's Upstream Gas Offering, Saudi Aramco announced it will partner with today's bid winner, a consortium of Italian oil company ENI and Spanish oil company Repsol, to find and develop gas reservoirs in a 52,000 square-kilometer area of the Kingdom's Rub' al-Khali Basin. This area, dubbed Contract Area C, is the last of three areas that went up for bid. Contract Areas A and B were granted to successful bidders Lukoil and Sinopec, respectively. 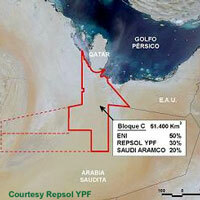 Earlier today, Ali I. Al-Naimi, Minister of Petroleum and Mineral Resources, announced that the ENI-Repsol consortium had won the bid for Contract Area C. To explore this area, the consortium and Saudi Aramco will establish an exploration and producing company, with Saudi Aramco as 20 percent shareholder. "Saudi Aramco is very pleased to have another opportunity to partner with international oil companies," said the company's president and chief executive officer, Abdallah S. Jum'ah. "We look forward to putting forth our best efforts to leverage the Kingdom's natural resources," Jum'ah said. "We recognize the importance of natural gas to the future of the country, and it's gratifying to see ourselves participate in this endeavor." Tullow Oil farms out interest in Kiarsseny Licence, Gabon. First Well Imminent.